This slow cooker tuna casserole could not be easier! You’ll love making this recipe for those quick weeknight dinners. 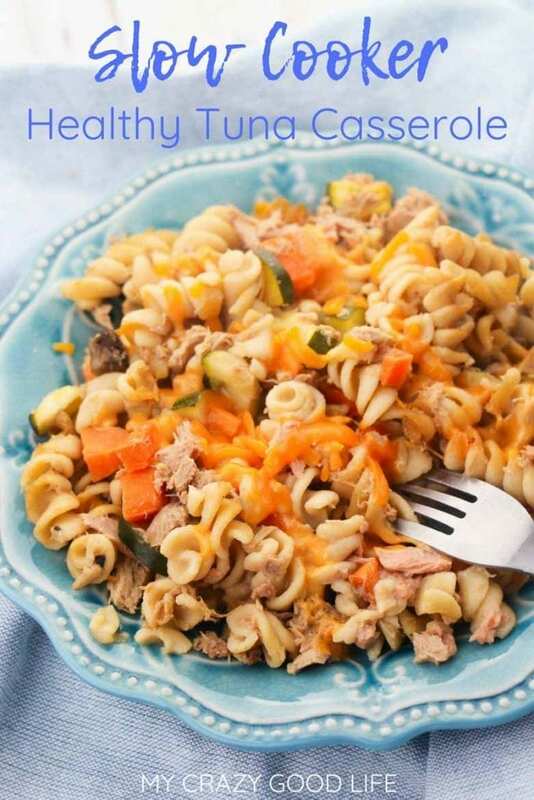 You can easily customize this healthy tuna casserole by including your favorite veggies! 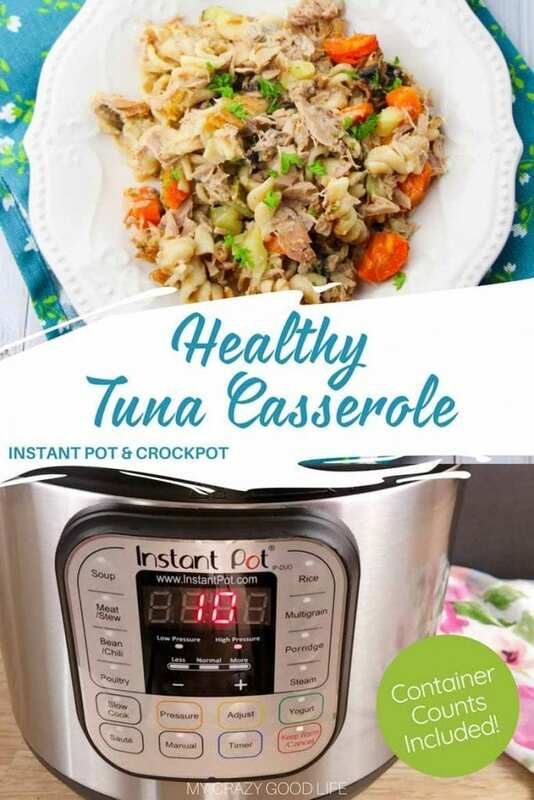 Instant Pot instructions for making this healthy tuna casserole are below. Making dinner in the Crockpot or the Instant Pot is my favorite. I love putting everything together and walking away! I use the time to workout, clean up the house, or spend some extra time with the kids. We all have ten things going on at any given time right? Hovering over a delicious dinner is not always in the cards for me. 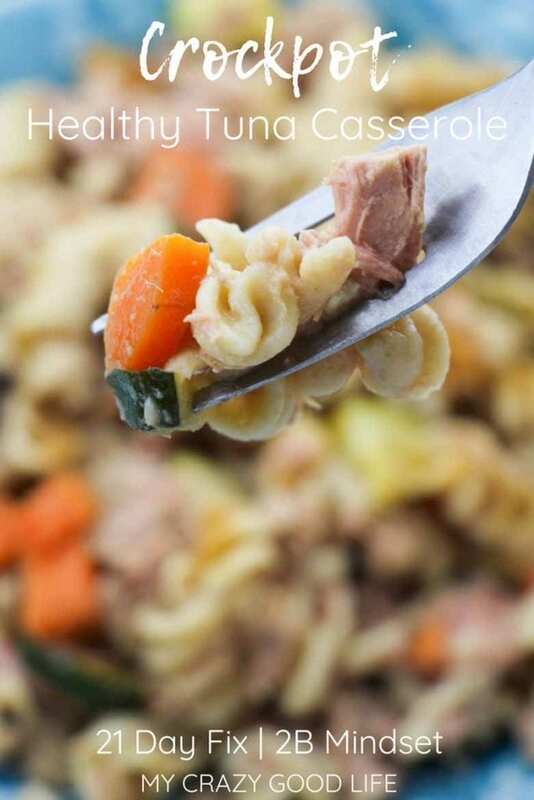 This slow cooker tuna casserole is great for the whole family. Everyone loves it and I bet even the picky eaters can be persuaded with some melted cheese and their favorite veggies. Add all ingredients except cheese to a slow cooker and stir together. Use this Fix approved, healthier cream of mushroom soup recipe instead of the canned stuff! If you want to mix it up a little, try using this healthy Cream of Asparagus soup instead! Place the lid on your crockpot and cook on high for 1 1/2 hours. Serve and top with cheese, if you’d like. Add pasta to the Instant Pot. Then add all other ingredients, including 3 cups of water. I stir my recipe to avoid the burn warning, but I know a lot of people put their water on the bottom to avoid it–do what works for you! Close lid and set your pot on high pressure for 4 minutes. Quick release and stir! It’ll be super hot–let it cool before eating. Can this Tuna Casserole be Frozen? It sure can be frozen! Make individual servings or a big batch to freeze. I reheat the frozen casserole in the microwave when I’m ready to eat it. This makes it an even better dinner idea for busy weeknights, and a great meal to bring to a new mother or grieving family. Boil noodles on stove top. While you’re waiting, you can open the tuna and use a fork to break it up. While noodles are cooking, saute the veggies you’ll be adding. Drain noodles when cooked and add cream of mushroom soup, veggies, and tuna. Cook on low for 15-20 minutes or until thoroughly cooked. This slow cooker tuna casserole could not be easier! You'll love making this recipe for those quick weeknight dinners. 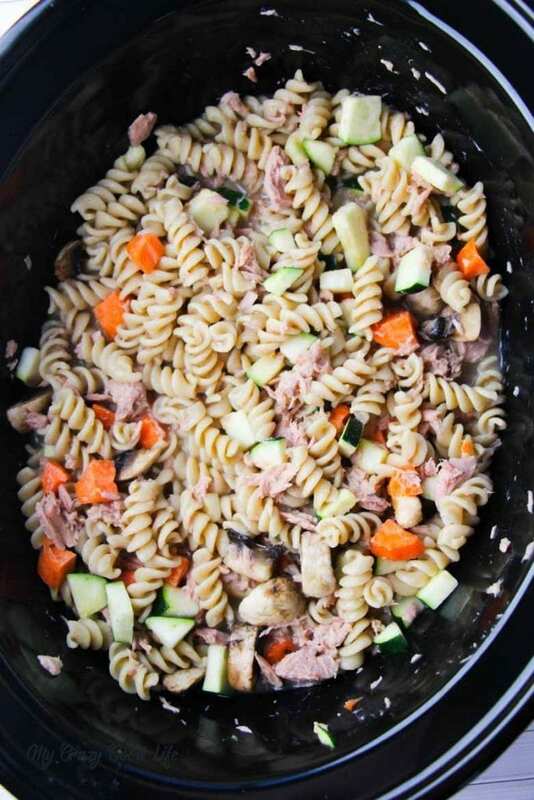 You can customize this healthy tuna casserole by including your favorite veggies! 2 C vegetables Anything you like! Mushrooms, carrots, and zucchini are good ones! Add all ingredients except cheese to a slow cooker and stir together. Place lid on crockpot and cook on high for 1 1/2 hours. Serve and top with cheese. Quick release and stir! It'll be super hot–let it cool before eating. can you replace the tuna with canned chicken? Everything else the same? Are you meaning the five oz flat cans of tuna? 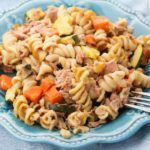 This recipe has all of my favorite ingredients for tuna casserole. Unfortunately, I can’t get away from the “burn” alert. Ugh. Oh no!! Are you spraying the pot with oil before starting, and are you stirring the contents before cooking?